You have just one knob. Use it wisely. Audio waveforms move up and down, above and below zero over time. If a system isn't properly grounded, this 'zero' may be slightly too low or too high when a recording is made - potentially a problem on very well-modelled analogue hardware emulation plugins, too. While it's not something you can necessarily hear in isolation, it does mean that your audio signal won't be able to get up (or down) to its maximum headroom before clipping. Got it? 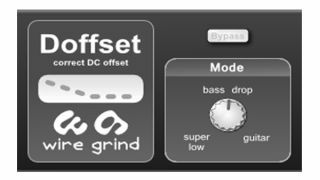 So, Wire Grind's Doffset automatically turns that DC offset up or down, getting back to zero on any dodgy audio recordings and allowing you to amplify them further than you could before. You can choose from three modes, each offering a different trade-off between bass response and the time it takes to properly sift through your signal and apply the right process. Most basically, Doffset adds or subtracts an amount it detects to be fit from every digital sample in your audio. You can get it on the Wire Grind website in 32- and 64-bit Windows VST formats.